At first glance, Google Insight for Search looks like Google Trends combined with Google Analytics. 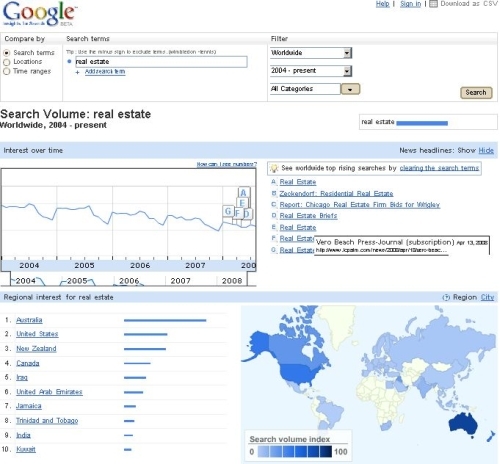 The charts (or trends as Google likes to put it) is pretty similar to what we can get from Google Trends and the regional hotmaps reflects what can be obtained in Google Analytics. This tool makes a good free alternative for Adwords Advertisers and marketers to mine keywords and understanding what topics are hot in certain areas of the world. It might just help you have a finer lens to look and think what to promote and where to run your marketing or affiliate campaigns. On the other hand, Google has also recently updated their adwords keyword tool to show numbers of how many times a keyword is searched. Coupled that with the recently released Google Maps Street View for Australia and Japan, it really seems like we’re constantly being flushed with goodies from Google this year!